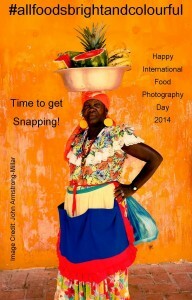 This year, the theme was Snap the Rainbow. All you needed to do was capture the glorious colours of food on 'phones or cameras and share them with us.....my, did you share your spectacular images! 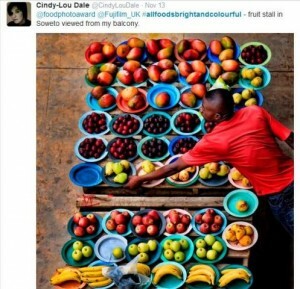 Here is a selection to show you some of the vibrant colours and foods. The Fujifilm X-E2 is a multi-award winning CSC compact system camera, packed full to the brim with technology and delivers outstanding image quality. The X-E2 comes with a XF18-55mm lens. The 18-55mm versatile short zoom lens which covers a variety of frequently used focal lengths from 18mm wide angle to 55mm telephoto. A perfect range for nearly all photographic subjects. If you enjoyed taking all of your vibrant food photographs, don't miss your chance, enter Pink Lady® Food Photographer of the Year 2015! You could win £5000 and have your photography published around the world. To find out more visit our 'how to enter' page. 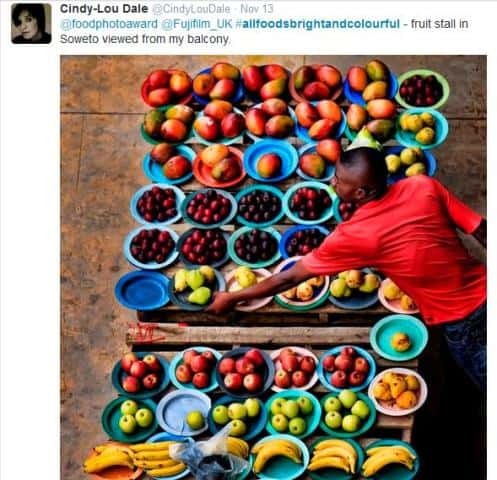 After much debate and difficult decision making due to all of the amazing entries, the winner of the International Food Photography Day competition 2014 is Cindy-Lou Dale for the image 'Fruit Stall in Soweto viewed from my balcony' seen below. Many congratulations and huge thanks to everyone that took part in the celebrations this year, we were completely amazed at the sea of colour you shared.